Mr.CZ: "It seems you're clicking pictures more than you're packing! Every time I come in here, you're clicking photos." Me: "Wha....?! I don't think you should come into this room anymore!" Uff, I don't want to talk about it! Back to topic of the day: How I (used to) store My Perfume Collection. I got the basket with some Lakmé products sometime back, btw. I somehow ended up keeping it there, and decided to put the perfumes I wear the most in it. I can take only one perfume with me to England! Goodness Gracious! Right now I'm thinking Juicy Couture Viva La Juicy, coz the strong fragrance would suit the freezing cold weather in Newcastle. I don't want to leave my Marc Jacobs Daisy & the bottle is lighter in weight, but I'm planning to get the new Marc Jacobs Dot as soon as I get there, so makes sense to carry Juicy Couture from here, no? Okay, so my wardrobe is where that perfume cabinet is. Got it in August last year (geez, how time flies!) If you follow me on Twitter, you might have already seen it, coz I posted a pic then. At the time, we sort of knew we might be moving this year, and buying new furniture didn't seem sensible, but my old one was coming apart. Damn sensibilities when my sweaters were balancing on a tilted plank of wood! Middle ~ Single door with 5 small compartments. Jewelry & some handbags also go here. Right ~ Double doors with 4 compartments. Price ~ Rs.50,000 ($900) from Lifestyle Home Centre. Photos were taken with my phone at the store. 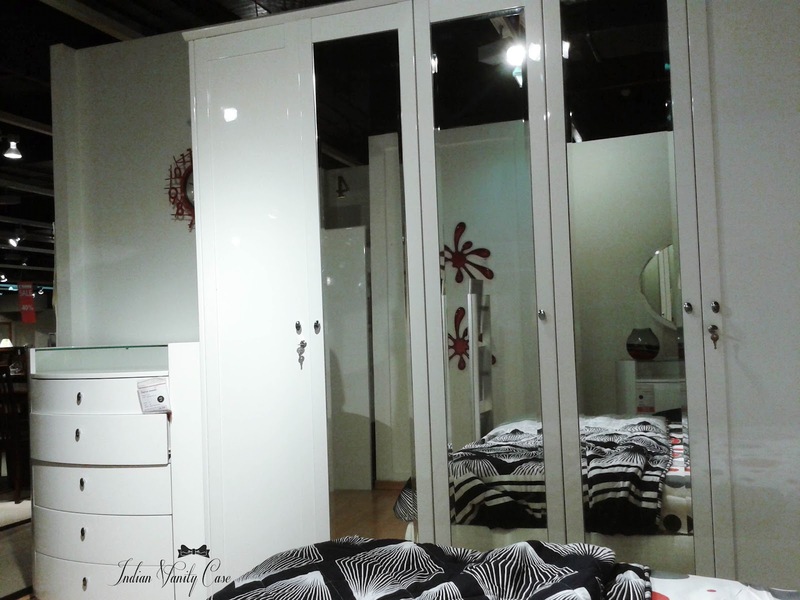 They had a whole white theme going- with matching king-size bed, side tables, vanity table, storage drawers, etc. 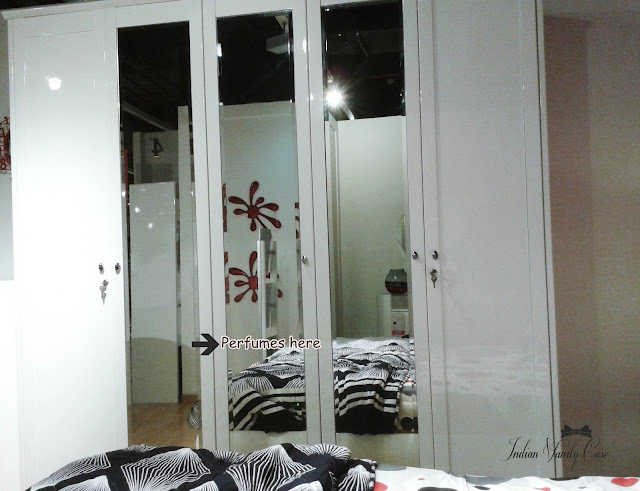 The drawers on the left was about Rs.24,990 ($450) - if I'm reading the blurry price tag correctly. Vanity Table with mirror (seen in the mirror there) was a little more expensive. What cuteness!! And yes, I'm interested. Hehe..nevermind about typos girl :D . Yes, it's so tough to choose! great post! Loved it ^_^. And wow, you have great taste in perfumes!! Yes yes would love to see more ^_^. AWESOME.....soooo many perfumes! lovely setup! Viva La Juicy is my Fav. Perfume .Take that with you. Did you buy this in India? I am interested pics of your whole house :D.. god what a nosey poke i am.. hehe. I think we have seen a few pics of your living room but never really much of your house. Hahaha...that makes 2 of us :P Will definitely try to make time for clicking pics! BTW, what are you gonna do with rest of the perfumes? Wow! It's really beautiful collection of perfumes and I think I can image the smell as well. I loved your wardrobe too which is just resembling a treasure itself. really love ur blog!!! and also ur sense of humour! !